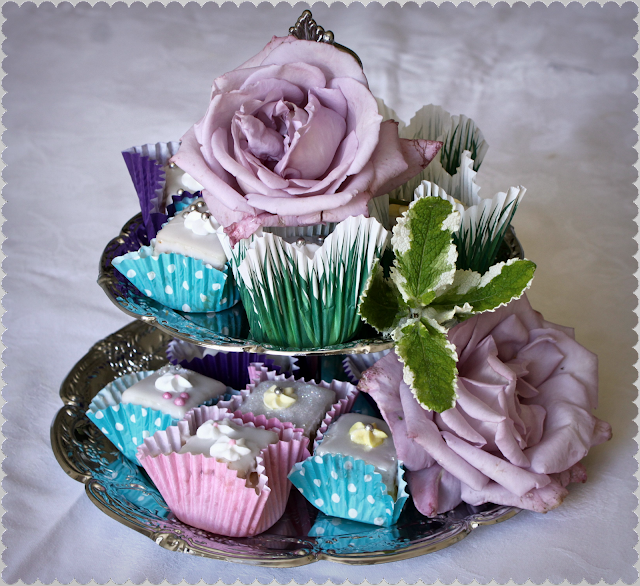 I’ve always loved what Mr Kipling winkingly calls ‘French Fancies’; a frou-frou can-can cake clothed in shiny fondant, hiding a petticoat blob of butter cream, and boasting sugar paste flowers like a garter. It may be painfully sweet but size matters; in this case small is beautiful. My friend Lavender Bakery, who used to work at Konditor and Cook, showed me how to make them. Below is a step by step. Do not on any account buy the icing sugar known as fondant icing. It doesn’t work. It will not cover the cake sufficiently. Buy ready-made fondant, which you can thin with a little glucose syrup. 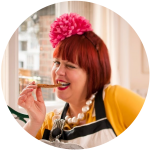 Or, you can go the whole hog and do what baking blogger Maison Cupcake did, make your own fondant from scratch. This week I was sent her pretty little book, her first, called ‘Sweet bitesize bakes’, containing 25 recipes for perfect tea-time treats. 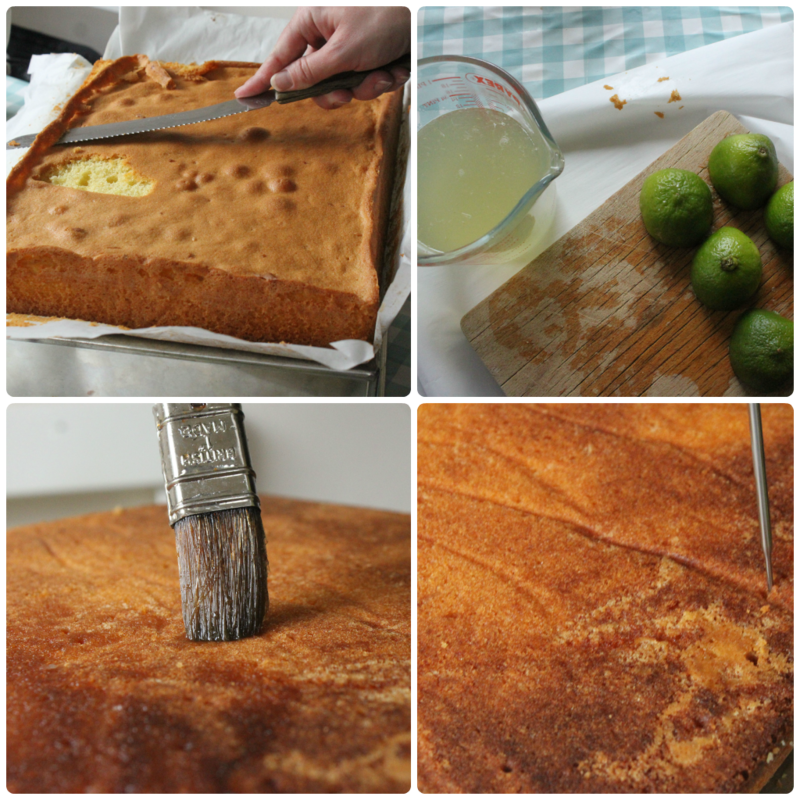 Make a sponge cake, either lemon or vanilla. Equal parts butter/sugar/eggs/flour + flavour (say vanilla) baked in a square/rectangle tin with sponge at least a couple of inches high. You will need a large perfectly straight sided baking tin. If making a lemon sponge, flavour the batter with the zest of 1 lemon. If making a vanilla sponge, flavour the batter with vanilla seeds or extract. Bake the cake, let it cool, then with a sharp knife, shaving off any bobbly uneven bits. Place it on top of the straight sided square baking tin, turning it over so that the good side is facing upwards. Make the sugar syrup, flavoured with a little lemon or lime. 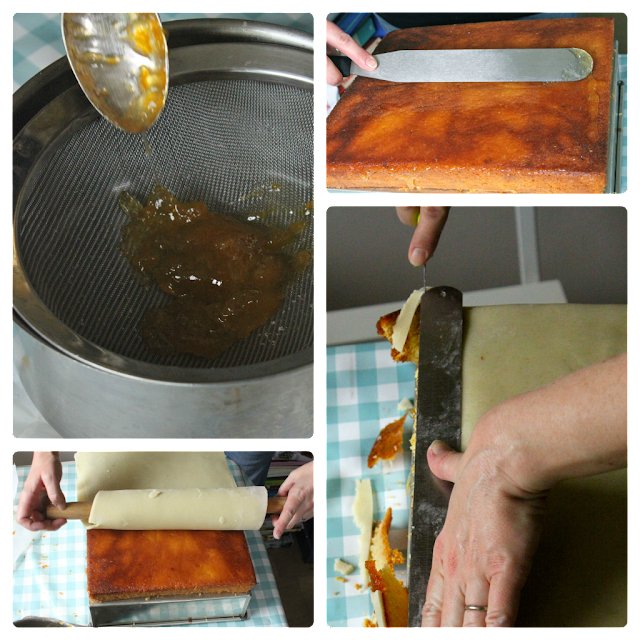 Make small holes all over the top of the sponge so that it absorbs the syrup (which keeps the cake moist). Brush the syrup onto the top of the sponge. Push the apricot jam through a sieve to get rid of lumps, then heat the apricot jam. Using a palette knife, spread it all over the top of the sponge. Then knead your marzipan until it is malleable. 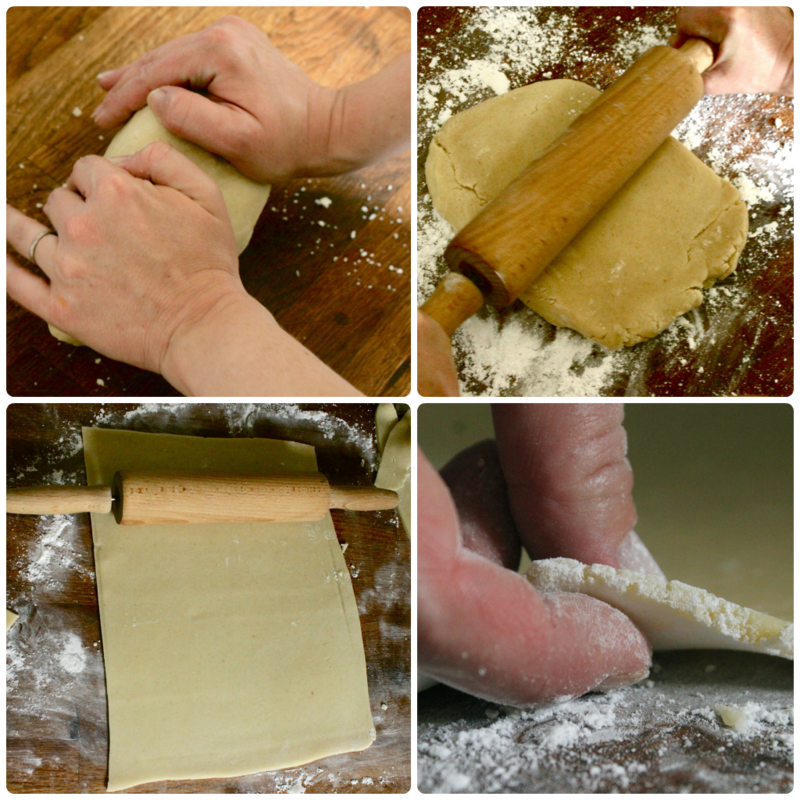 Using a rolling pin, roll it out until it is 3 mm thick. Place the baking tin with the sponge on top, carefully on the marzipan, cut around the tin. Remove the baking tin and put it on a flat surface. Drape the marzipan over the rolling pin and lay it, rolling it out, over the sponge cake. Using a knife and a metal ruler, square off the cake. Mark out, with the metal ruler, 5cm by 5cm squares. Next heat the fondant gently in a bain marie. NEVER let it boil, it loses it’s shine. If it’s too thick, add a little glucose. Start to dip your sponge cake squares in the fondant. Turn them over quickly and place on a cooling rack. (I covered my work surface with baking parchment, otherwise your kitchen can quickly become a gooey mess). Let the fondant run down the sides of your very straight cubes. Quickly place the cases around the fondant fancy, the case will stick to the fondant. (I always thought they used special square cases but they use round cases). Decorate with sugar flowers, silver sprays and other decorations. Don’t store in the fridge – it melts the fondant! haha! yup, easy when you know how. What a nightmare they were with the 'fondant' icing sugar…. Wonder what is different about fondant icing sugar. I used it recently for a choc frosting (bought in error) but it was fine for that – glossy and smooth. Looking forward to making the ff's! Look fab. PS Like the new header! Curious Cat: you can put a blob of buttercream underneath if you like, I didn't. well done they look lovely. I wimp out and cover mine in chocolate but will try out these fondant covered fancies! Having tried these with buttercream layers too, I came to the conclusion that the Mr Kipling version with bobbles of buttercream giving a domed top were only achievable when manufactured. The problem with buttercream at home is that the hot fondant dip melts it immediately. Having said that, after going through my crazy stage of 3am fondant fancy dipping during writing the book, I think in future I'd give the buttercream version another go but using the easy peasy Squires fondant icing – although this does work out much more expensive. We need to see more fondant fancies, they make a change from cupcakes! These look marvellous. 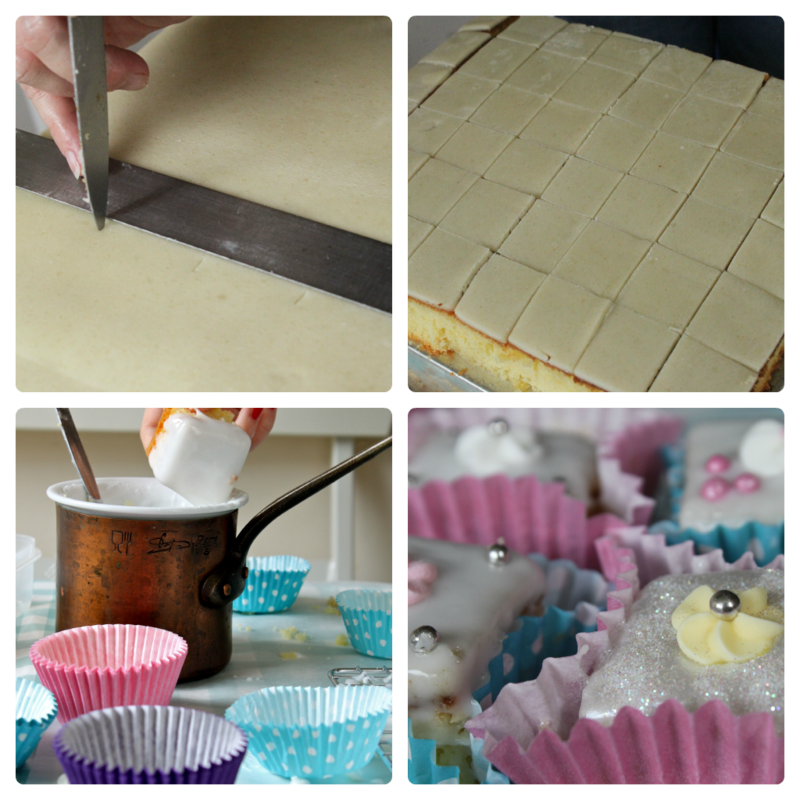 I love fondant fancies, I've been buying them from the waitrose bakery recently but would love to try home made ones. I'll have to grab myself a packet of marzipan! Oh my god!!!! I really must give these a go. I have a four year old step-granddaughter who is really into baking and glitter. She will just love decorating these.